The other day I found a Tumblr page that posts loads of Dresden Files quotes. Ever since I ‘met’ Harry Dresden back in 2012 I’ve been a big fan. I love Harry’s wry, often childish sense of humor, his daft comebacks to bad guys galore, his selfless heroism, his absolute lack of social graces, and his downright niceness. He’s one of my favorite characters, and I’m thrilled that Jim Butcher has kept Harry ticking this long. In fact, Jim has not only kept the series ticking but positively thriving, constantly beating himself at his own writing game and raising the bar each time just that little bit higher. Anyhow, like I said, I found a Tumblr page. And soon I was looking up the quotes on my kindle, because I kept remembering great scenes and then had to read them over again. 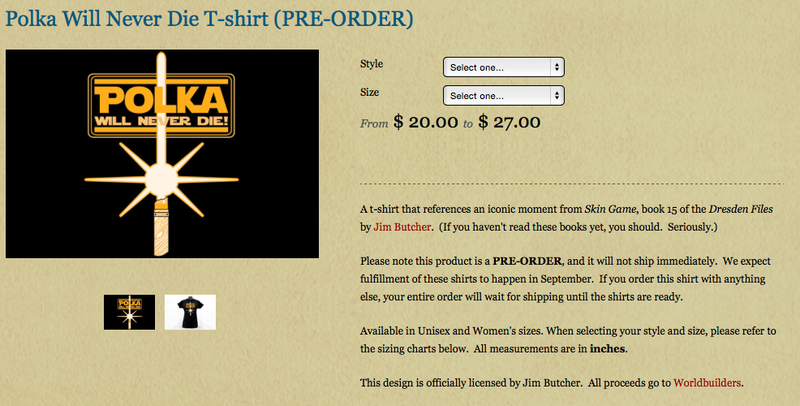 It didn’t help that I’d just ordered this awesome Dresden Files inspired t-shirt from the Worldbuilders charity*. Next thing I know, I’m pulling up book number 1 and diving into it again, ‘just to refresh my memory’. By the time I hit book 3 I knew I was in full-on reread mode, and nothing was getting between me and all 15 Dresden Files novels. Now, I love the feeling you get when you’re about to dive into something new as much as the next fiendish reader. But, equally, there’s nothing quite like getting into something beloved and familiar. Rereads are tea and a chat with an old friend, they’re beer at the pub with that long-lost college roommate, they’re a stroll in the afternoon sunshine with the family dog. I may be losing the plot here a little, but you get my point, right? Or do I have to bring the dog into it again? Anyhow, here’s my first installment, books 1–5. In my defense, I blame Tumblr. This is our first glimpse of Harry Dresden, Professional Wizard. The only wizard who advertises his services in the phone book. As the intro novel, this is, inevitably, the lightest book in the series. 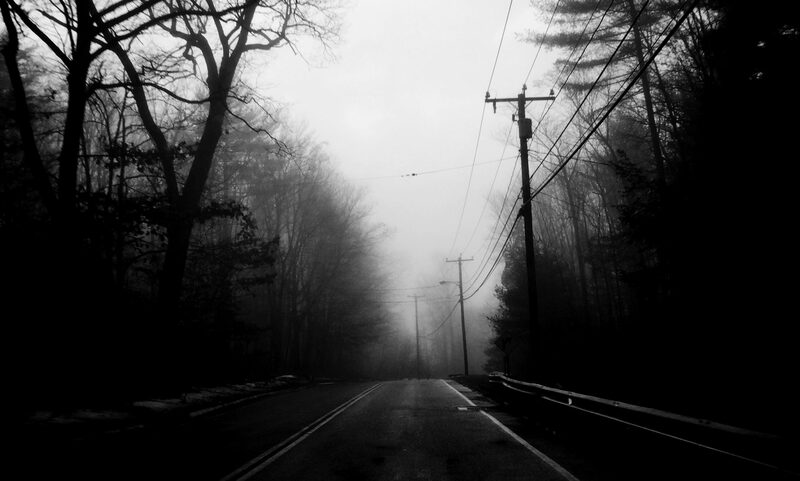 But there’s just enough darkness lurking at the corners to give us a taste of things to come, with hints of Harry’s troubled teenage years as orphaned ward and apprentice of a dark wizard, and the Doom that hangs over him, threatening him with the death penalty if he steps out of line. As Harry races against time to uncover the murderer behind a series of gruesome killings we are introduced to some of the recurring characters such as Lieutenant Karrin Murphy, Director of Special Investigations of the Chicago PD, mobster boss Gentleman Johnny Marcone, reporter Susan Rodriguez, and my favorite magical sidekick ever: Bob the skull. Among several others. In fact, I had forgotten that this first novel sets up so many building blocks for the series, with introductions to the White Council, the laws of magic and the fae world. It was certainly a lot more complex than I remembered, and all in all, a great kick-off for all the books to come. Fool Moon doesn’t just kick things up a notch, but blasts them into a whole other high-octane wavelength. Jim hands us the perfect werewolf thriller on a platter, but is he content with giving us one, run-of-the-mill werewolf? No. Oh, no. We have four types of werewolf in action here. We have classic werewolves, humans who use a spell to transform into wolf shape, represented by college student Bill and his vigilante Alpha pack. We have hexenwolves, humans transformed into wolf form by outside magic, represented by a rogue group of FBI agents. We have lycanthropes, who channel spirits of rage, turning beast-like in their own heads without actually shape-shifting. Like Viking berserkers. This group is represented by the Streetwolves gang. And finally we have the loup-garou, closest to the monster-movie version of the werewolf. The loup-garou, in this case businessman Harley MacFinn, is the recipient of a curse that causes its victims to become a wolf like demon at full moon. Oh, and then there’s MacFinn’s fiancée Tera, who turns out in the end to be a wolf in human form. A were-human, I guess? So yes, a lot of wolves. And a deliciously twisty plot, full of red herrings and deceptions. This is my absolute favorite among the first five novels. Not only is it a lot of fun, but it also introduces the RPG-playing, pizza-loving, greatly geeky Alphas, one of Jim’s nicest minor character inventions so far. This novel introduces yet another great recurring character, Michael Carpenter, Knight of the Cross and bearer of Amoracchius, one of three mystical swords. Not only that, but we get our first look at Harry’s fairy godmother, the Leanansidhe, and of Thomas Raith, the White Court vampire. With Grave Peril, Jim Butcher starts digging deeper into fae, vampire, and wizard politics, with the hunt for a demonic ghost nicknamed the Nightmare tangling with the start of an all-out war against the Red Court of vampires. In this novel, Harry is substantially weakened by an attack from the Nightmare, but true to form he never gives up, and keeps on going, refusing to admit defeat. This is one of Harry’s best traits; this dogged determination to do the right thing, no matter what. Leaving the vampires to one side for a moment, Harry is plunged into fae politics by taking on a case for none other that Mab, Winter Queen of the Sidhe. With a war looming between Summer and Winter that can hold big repercussions for the mortal world, Harry has a tight deadline in which to unravel all the complex threads of fae relations and motives and figure out who stole the mantle of power of the Summer Knight, where it’s being hidden, and why. This book is a dive into the world of the fae queens and their courts, and as a bonus we get to see the Alphas in action again, along with a group of fairy changelings, and the wyldfae Toot-Toot and his gang of dewdrop fairies, whose unwavering loyalty Harry gained in the first novel with gifts of pizza. We also meet White Council member Ebenezar McCoy, the mentor who took the young Harry under his wing when he was under Council probation. Book 5 pitches Harry against the Denarians, fallen angels attached to human hosts. In this, he has help from not only Michael but all three Knights of the Cross: Shiro, bearer of Fidelacchius and Sanya, bearer of Esperacchius. While Harry is busy chasing the stolen Shroud of Turin and attempting to stop the leader of the Denarians, Nicodemus, from setting off a plague curse that would kill thousands, he also has to prepare for his upcoming duel with Duke Ortega of the Red Court of vampires. This novel introduces one of Harry’s creepiest adversaries so far, the Denarians. Not only are they horribly powerful and utterly evil, but the power they tempt Harry with is one he has to steel himself against or risk taking it up with the best intentions, only to fall with the rest of them. Bonus Gandalf-refusing-the-Ring quote.